Fujifilm has developed a new real imaging system which consists of three dimensional (3D) digital cameras, 3D digital photo frames, and 3D printing. 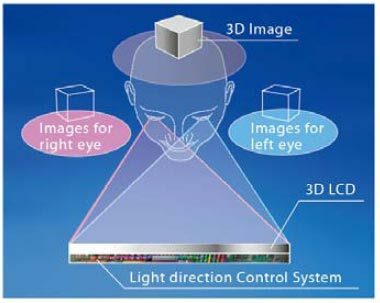 The 3D image system boasts advanced image signal processing and micro-component technologies, and so far has been able to demonstrate fairly high quality within the system. Fujifilm’s 3D system does not require special 3D glasses and does not have the poor image quality associated with many previous 3D technologies. The importance in the Fujifilm FinePix Real 3D System is that with LCD playback displaying and printing with users’ digital cameras have the same image quality as originally seen by the naked eye. At the heart of the 3D Digital Camera are two lenses that acquire stills or movies from a slightly different position each time, creating the foundation of the 3D image. By incorporating a dual lens system, new functions such as simultaneous dual-image shooting and multi-expression images can be achieved. Researches at Fujifilm have produced a new chip called the “RP (Real Photo) Processor 3D,” which is essential for synchronising data that passes between both CCD sensors and instantaneously blends the information into a single high quality image for both stills and movies. The camera also has a “built-in 3D auto” function which determines optimal shooting conditions from both sensors. This means that when the shutter is pressed, key metrics for the image such as focus, zoom, range, and exposure. are synchronised. The FinePix Real 3D Photo Frame has an 8.4-inch LCD monitor which has over 920,000 pixels. The display uses the same LCD technology of the cameras, which promises reduced flickering and image ghosting. The researchers have also developed a new “light direction control module” in the back of the LCD that has the ability to control light from the right and left eye directions. This feature enables easy viewing as there is no need for the special 3D glasses. Using know-how gained through years of development of Frontier, Fujifilm has developed a 3D printing system using a fine pitch lenticular sheet, giving high-precision and fine quality multiple viewpoints, which 3D Fujifilm claims to be unprecedented. TFOT previously covered TDVision’s future 3D Blu-ray technology as well as a spherical camera sensor that follows the form and function of a human eye by building a circuit onto a curved surface, allowing a wide field of view that can’t be produced in digital cameras without a high degree of complexity. Additional information on the new 3D system can be obtained at the Fujifilm website. More information can also be found here.